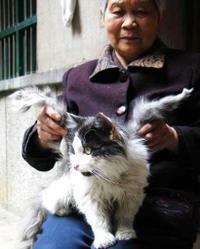 Feng, of Xianyang city, Shaanxi province, says the wings, which contain bones, make her pet look like a 'cat angel'. Her explanation is that the cat sprouted the wings after being sexually harassed. "A month ago, many female cats in heat came to harass him, and then the wings started to grow," she said. Whether or not this is true, it's pretty much one of the cutest wishes I've ever heard of. I recorded a short narration of an excerpt of novelist Alexander Besher's newest tome: The Manga Man, (né The Hanging Butoh). Mr. Besher wrote one of the most fascinating sci-fi trilogies I've ever read, called "The Rim Trilogy." My voice is now captured on his site. Go to: Alexanderbesher.tv and click on the icon. Click on "Coming Soon." Read through the reviews, and then scroll down to the bottom, where you can click on a link to "Listen to an audio excerpt from THE MANGA MAN."